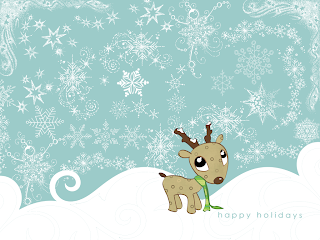 This reindeer baby is an original illustration I made using Photoshop. I really had more plans for him, but just didn't have the time to make them happen. 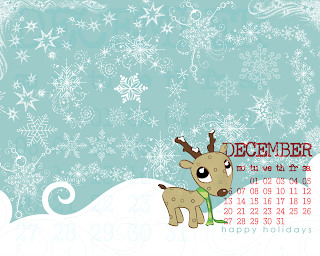 But I'd like to share him at least a little bit, so here he is gracing a winter desktop background. You may also download either size and use as a free blog background! So freakin' adorable! Thank you so much! I don't think I ever saw a November background so I have had October on my desktop and I just didn't know what to do if there wasn't going to be a December so thank you! I love it, Janny! I just set it as my work desktop background. Thanks! Thanks! My daughter and I have been waiting and waiting! We love it. You so rock! I would love to use this as my blog background, but I can't find the code anywhere. This baby reindeer is adorable!! !